It’s useful to distinguish between the quality and quantity of capability. In terms of quality, the Anzac class is a long way from its original infamous ‘fitted for but not with’ configuration. After a series of upgrades (see the table below), the Anzac is now tonne for tonne among the best frigates in the world. And, as noted in the table, further upgrade projects are either planned or underway. Central to its new capability is the anti-ship missile defence program that upgraded the excellent Saab 9LV combat management system and installed the world-leading CEA Technologies’ phased array radar to target the Evolved Sea Sparrow missile against incoming cruise missiles. The upgraded system has performed very well in trials. Australia is also participating in the international consortium that’s producing an enhanced version of the ESSM designed to counter modern supersonic missiles. This will equip the Anzac, Hobart and Hunter classes. The replacement of the Anzac’s long-range search radar with a version of CEA’s phased array radar has begun. Taken together, these improvements significantly enhance the Anzacs’ self-defence capability in air warfare and give them some ability to protect escorted vessels. 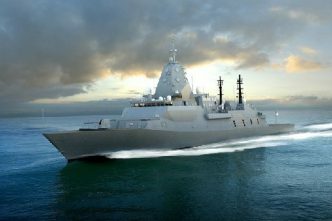 But the lack of the Aegis combat management system and SM-2 long-range air defence missile means that the Anzacs don’t have a true area defence capability; for that, the navy will have to rely on its three Hobart-class air warfare destroyers until the Hunter class frigates come on line. 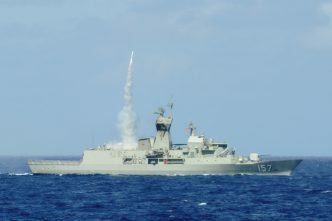 Hypersonic missiles will likely become operational while the Anzac class is still in service and will certainly be challenging to counter, but they will threaten the survivability of any surface ship, not just the Anzacs. 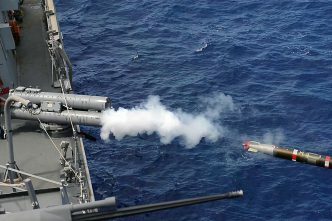 In terms of anti-surface warfare, the Anzac’s five-inch gun is consistent with those of other major surface combatants, but its main anti-ship weapon, the Harpoon missile, is now dated. 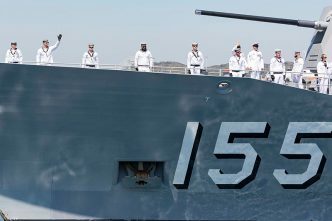 It has a shorter range than threat weapons and it has neither of the main attributes that contemporary missiles use to overcome ships’ defences—supersonic speed and stealth. The integrated investment program suggests that Defence will acquire a more capable weapon for the Hunters, so it’s possible that it could be installed on the Anzacs. The Seahawk Romeo helicopter provides a useful capability against swarming attacks by small vessels. Strangely for the navy’s main anti-submarine warfare ship, the Anzac has mixed capabilities in this regard. 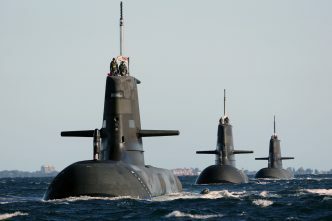 The Anzacs were fitted for a towed array sonar but they never received it, and there’s no indication in the integrated investment plan that Defence intends to install such a system. Somewhat ironically, the air warfare destroyers do have a towed array, but there are only three of those ships. Again, the situation won’t be significantly improved until the Hunters arrive with their own towed arrays. This shortfall is partially offset by each Anzac’s Romeo, which has a capable ‘active dipping’ sonar. Two helicopters operating in coordination with dipping sonars can make life difficult for submarines. Unfortunately, each Anzac has only one hangar and consequently one helicopter. The navy has been quietly but effectively progressing its ‘crawl, walk, run’ strategy for the adoption of uninhabited aerial systems. Since some smaller drones could fit alongside a Romeo in the Anzac’s single hanger, they offer the possibility of enhancing the ship’s aviation capability, in particular by providing greater endurance for surface surveillance. But without a second hangar or mission bay, the potential to integrate autonomous systems without giving up the Romeo that is central to the ship’s anti-submarine capability is limited. The class has recently, or is currently undergoing, upgrades to other systems such as the electronic support and communications suite. So, the good news is that overall the Anzacs compare well with other small frigates. The bad news is that it will be challenging to keep the capability relevant against likely threats for the next 24 years. The upgrades have increased the ship’s weight from its original 3,600 tonnes to 3,900. It probably can’t get any heavier, and the air-search radar replacement may be the last substantial physical alteration made to the vessels. A towed array sonar could be an upgrade too far, even if funds were available. It probably won’t be possible to deploy new solutions like lasers on the Anzacs. The ships’ upgrades have cost over $2.2 billion, though across a fleet of eight that looks like pretty good value for money given that each Hunter-class vessel will cost at least that much. But finding funds for further upgrades could be difficult as the future frigates and submarines absorb more of Defence’s capital budget. Much of the cost of defence projects is in design and engineering, which remains the same regardless of whether you buy or upgrade one, eight or 108 systems. So as the Anzacs approach retirement, the value for money of a final round of upgrades for a shrinking subset of the fleet may start to look questionable. The last Anzacs may be left to serve out their time with many of the same systems they have now. Such is the challenge with extended transitions. That trajectory may amount to a relatively graceful degradation, however. The substantial commonalities between the Anzac and Hunter classes, in their radars, combat management systems, missiles and helicopters, will help. 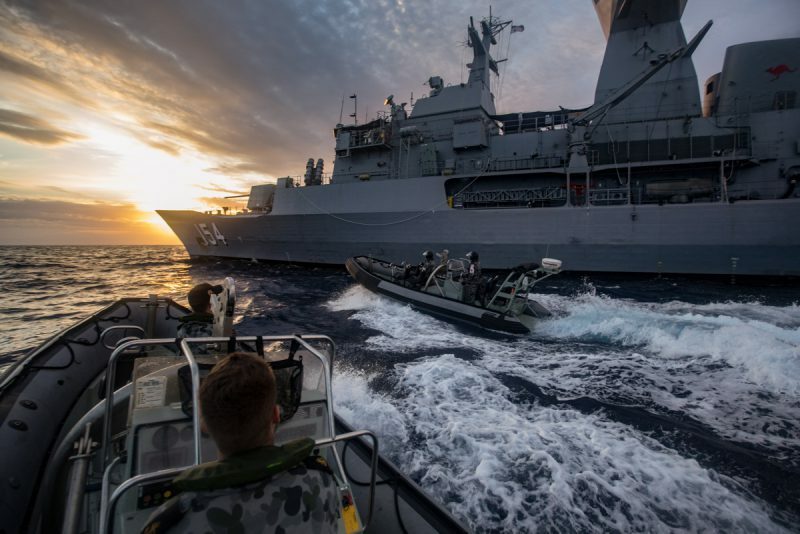 The government’s decision to mandate the Saab 9LV combat management system across the navy’s entire surface fleet, for example, means that improvements to it will be fed back into the Anzacs. Similarly, as the potential of CEA’s radars to conduct tasks such as electronic warfare and secure communication is realised, they can also be used to enhance the Anzac. But the issue of quantity may be more problematic than the issue of quality. I’ll look at that in part 3 of this series.